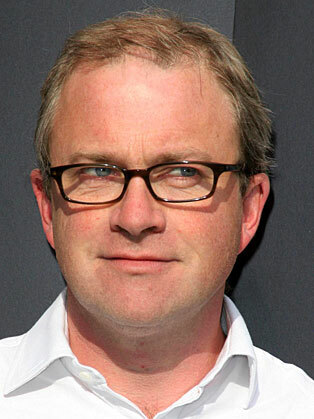 Despite early appearances alongside alternative comedians such as Ben Elton, Stephen Fry and Hugh Laurie, Harry Enfield has always viewed himself as a traditional entertainer, his catchphrase-based comedy more reminiscent of Dad's Army than the anarchy of The Young. After meeting long-term collaborators Paul Whitehouse and Charlie Higson while at university, he worked as a gag writer for BBC Radio 4's Week Ending, and was recruited to Spitting Image while playing the comedy circuit as an impressionist. On Saturday Live he became famous for creating linguistically impaired kebab chef Stavros and obnoxious plasterer Loadsamoney, forever boasting of his newly acquired wealth. Concerned that the latter - intended as a satire on Thatcherism - was instead becoming a cultural hero, Enfield killed him off during Comic Relief Red Nose Day run over after presenting an over-sized cheque for just ten pence. Although film spin-off Kevin & Perry Go Large was a moderate success, Enfield's style of comedy began to seem out of step with popular taste in the wake of Whitehouse and Higson's The Fast Show. His Brand Spanking New Show was cancelled after one series, while reality TV spoof Celeb paled in comparison with The Osbournes. Enfield subsequently had a dramatic role in teen drama Skins. also directing three episodes. In 2007 he re-teamed with Whitehouse for Ruddy Hell! It's Harry and Paul, which was hailed by some as a return to form by the old masters - a view inevitably parodied by the duo in the title sequence for the follow-up, Harry and Paul, which depicted them as jaded Soviet dictators out of touch with the modern world.